Henry Farber (Princeton University) is the Hughes-Rogers Professor of Economics and an Associate of the Industrial Relations Section at Princeton University. As an active member of CERGE-EI’s Executive and Supervisory Committee (ESC), he recently visited us in Prague. In addition to his faculty position at Princeton, Prof. Farber is a Research Associate of the National Bureau of Economic Research (NBER) and a Research Fellow of the Institute for the Study of Labor (IZA). He is also a Fellow of the Econometric Society, the Society of Labor Economists, and the Labor and Employment Relations Association. Prof. Farber’s current research interests include unemployment, liquidity constraints and labor supply, labor unions, worker mobility, wage dynamics, and analysis of the litigation process. While at CERGE-EI, he sat down with 1st year PhD student Katka Kobylinski to discuss some of his research and policy ideas. Katka questioned him about the the challenges and achievements of labor economics. She also asked him for his thoughts about labor policy and austerity in US and Europe today, as well as his views about CERGE-EI and its evolution. After presenting his recent working paper, ‘Does Anticipated Regret Really Matter? Revisiting the Role of Feedback in Auction Bidding’, Dr. Peter Katuščák (CERGE-EI Assistant Professor) sat down for an interview with PhD student Liyou G. Borga. In their conversation, Dr. Katuščák discusses his recent paper and other research projects, his view on the efficacy of experimental economics, and several other topics. As an adviser to CERGE-EI students, he also shares his advice about choosing a research topic. Check it out in HD! 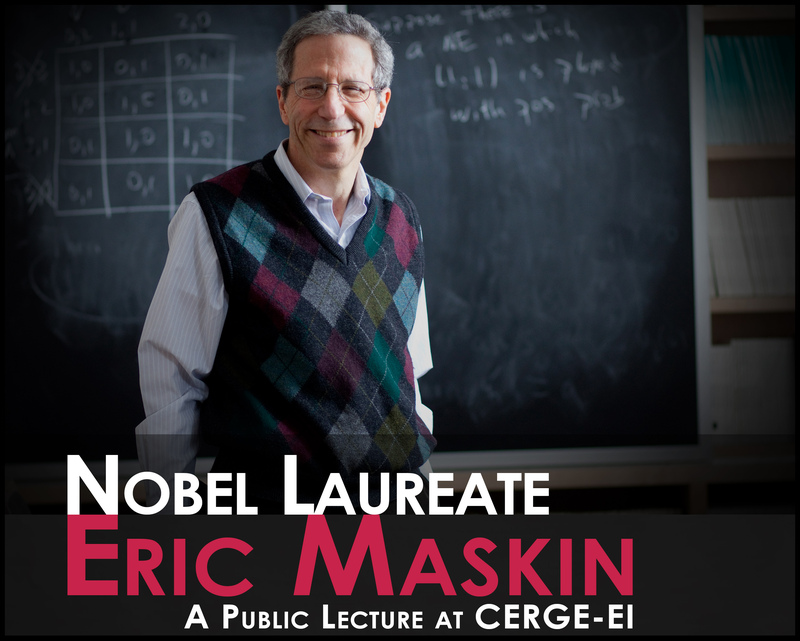 At the end of April 2013, we had the honor to welcome Prof. Eric Maskin (Harvard University) to CERGE-EI in Prague. On April 29, Prof. Maskin gave a public lecture titled “How to Make the Right Decisions without Knowing People’s Preferences: An Introduction to Mechanism Design”. To begin his lecture, Prof. Maskin contrasted the field of ‘mechanism design’ with other more familiar parts of economic theory. Whereas the bulk of economics takes existing institutions as a given and aims to understand and explain outcomes delivered by those institutions, mechanism design reverses the direction. It starts by identifying outcomes one wishes to achieve and asks whether institutions are able to be designed to achieve the desired outcome(s) and, if so, what these institutions ought to look like. In this sense, mechanism design can be called an “engineering” component of economic theory. To further illustrate the concept, Professor Maskin offered three concrete applications of mechanism design theory. They were, in the order presented, (1) how can you divide a plot between two people in a way that neither of them envies the share of the other?, (2) how can a government sell a license to allow transmission over a band of radio frequencies to a company which values it most?, and (3) how to choose a public energy source when individual preferences are different and optimal choice depends on the unknown state of the world? Professor Maskin explained how insights from mechanism design theory can provide answers to these intractable questions. Simple as they are, these examples illustrate key features of mechanism design. First, a designer of the mechanism does not know what the optimal outcomes should be. Secondly, the designer must proceed to indirectly convince participants to reveal necessary information. Finally, participants have their own goals and motivations which may not coincide with those of the designer. Therefore, the mechanism must be ‘incentive compatible’—in other words, it should recognize those goals and reconcile them with those of the designer. The examples presented during the lecture displayed transparent mechanisms that are implemented to achieve the designer’s goals. For those interested in a general way to understand whether a goal is implementable and, if it is, how to find a mechanism to implement it, Professor Maskin referred to his seminal paper, “Nash Equilibrium and Welfare Optimality.” Professor Maskin concluded with some further examples of possible future applications of mechanism design theory, namely the development of an international treaty on greenhouse gas emissions and the design of policies to prevent financial crises. Media economics, the study of the macro and microeconomic aspects of media companies and industries, is an ever-changing field. With new mediums of consumption, new audiences, and changing forms of entertainment, the research agenda is constantly expanding. Professor Anderson (University of Virginia) researches many aspects of media economics. He recently visited CERGE-EI to present his most recent paper, Media Market Concentration, Advertising Levels, and Ad Prices. “One of the major legacies of the recent financial crisis is the quest for measuring, assessing and monitoring systemic risk.” Professor Ester Faia (Goethe University Frankfurt) writes this in her recent working paper, which she presented at CERGE-EI in February. Professor Faia is interested in myriad aspects of understanding monetary and fiscal economics. Her research explores, among other things, financial regulation, optimal monetary policies, and systemic risks. In her recent working paper, “Endogenous Banks’ Networks, Cascades and Systemic Risk”, she and her co-authors develop a dynamic network model to assess the diffusion of risk in response to financial shocks and different prudential policy regimes. What is the connection between monetary and fiscal policy? How do the interactions between them explain the global financial crisis and its aftermath? Dr. Jan Libich, senior lecturer at La Trobe University in Melbourne, is deeply interested in questions of monetary and fiscal interaction and how an understanding of them may provide solutions to today’s difficult global economic problems. Dr. Jan Libich is a senior lecturer at La Trobe University in Melbourne and the School of Economics, VŠB-TU Ostrava.